The Canal Grande is a large canal in Venice. Next to St Mark's Square, it is the most important and best-known sights in Venice. The waterway is almost 4 kilometres long and about 50 metres wide. The canal divides the main island of Venice in two parts. There are only four bridges over the long canal, two of which are almost next to each other near the Central Station Venice. 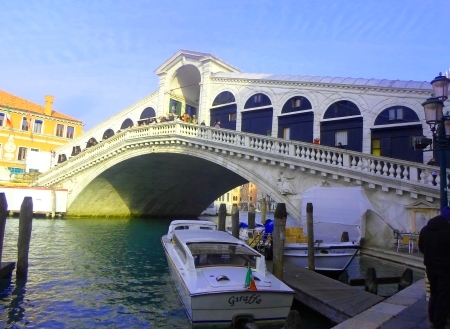 The most famous bridge over the canal is the Ponte di Rialto (Rialto Bridge) in the heart of Venice. The Canal Grande starts not far from the long bridge from the mainland (Bridge of Liberty, near the only railway station of Venice Santa Lucia) and ends not far from St. Marks Square. The big canal winds its way through Venice in an S-shape for four kilometres. The distance from the railway station to St. Mark's Square is only about 2.5 kilometres on foot. The wide canal is used by passenger ferries, which are the only means of public transport in Venice. The lines 1 and 2 of the so-called Vaporetti (name of the ships in Italian) travel along the entire length of the canal. 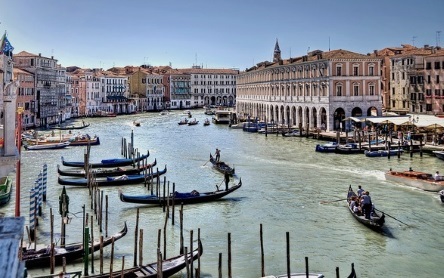 The Canal Grande is the most important waterway of the lagoon city and therefore very busy. In addition to passenger ships, cargo ships, water taxis and the famous gondolas of Venice also sail on the most famous city canal in the world (see: Ships in Venice). Swimming or bathing in the Canal Grande is strictly forbidden. If you have the money, you can rent a room in one of the many luxury hotels along the canal. Hotel rooms with a view of the Canal Grande are usually not exactly cheap. You can also enjoy the view of the Canal Grande in one of the many street cafes. In some areas, but not everywhere, a footpath runs along the canal. In the opinion of most tourists, however, the best view is from the water buses (ferries). A one-way ticket costs 7.50 euros, day tickets are available from 20 euros. The day tickets and multi-day tickets are valid on all lines, also to many other islands in the lagoon and much more. The video gives an impression of the palaces on the banks of the Canal Grande and the traffic on the world-famous waterway. In the background you can see the world-famous Rialto Bridge. The Old Town of Venice is an island.